Playdom is slowly rolling out a new "reforge" feature for Marvel Avengers Alliance where you can bring an old "Customized" weapon that you've out-leveled and "reforge" it up to your level so that it's useful again. It's not cheap though; it's 64 Gold per reforge. You get more details (as well as a list of items you can reforge) below. There's also a new weapon for sale, the Ironstar. The Ironstar is a fairly specialized weapon that works best if you run heroes that can cause bleeds like Wolverine, Black Panther, and Tygra. Otherwise it's usefulness is limited. The sound effect button is no longer displayed grayed out when the player turns the sound effects off and returns from battle after turning the sound effects back on in the Settings Menu. Hero information box on the news page now shows more helpful information. Rather than their class, it now shows the specific passive abilities of new characters and costumes. Reforging is a new feature that allows players to take select old “Customized” weapons and update them to the agent’s current level. We will not be able to retrieve any previously sold or slotted items in the player’s armory so that the player can reforge them. We apologize for any inconvenience this may cause, but we encourage players to keep all of their favorite weapons from this point forward, even if they are not on the list below. 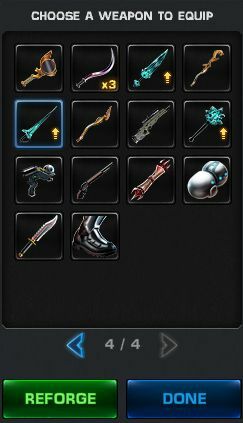 The reforge button is located on the Team page and will appear next to weapons that are eligible for reforging. Additionally, in your inventory, you will see a yellow “up” arrow noting that a weapon is eligible for reforging. A player purchases the Coulson’s Revenge at level 60. The weapon’s power level is set to 70 at this point. The player levels up to level 77 and feels their Coulson’s Revenge isn’t useful anymore. Don’t slot it in your armory! Just Reforge it! Reforging the weapon will bring its power level up to the agent’s level (in this case from 70 to 77). The player finds the Coulson’s Revenge either equipped to his agent or in his inventory, and clicks the green “Reforge” button. A confirmation screen will appear detailing the stats of the weapon before and after reforging. 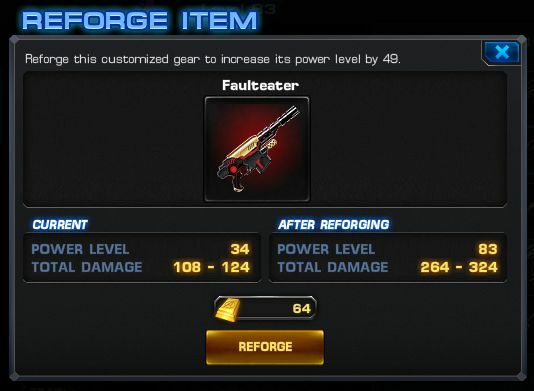 A player can reforge as often as they like as long as the power level of the weapon is below the agent’s current level. Meaning they could foreseeably reforge all 4 of their weapons each level if they wish to do so. Not all weapons are eligible. Here is a list of weapons eligible for reforging. Keep an eye on future patch notes as we enable more and more weapons for reforging! - It costs 64 gold 48 gold (they've reduced the cost) every time you do it (even if you only increase by 1 level), so you can end up spending a lot if you do it every few levels. I'd save doing it if you're at the low levels though. It tends to be more advantageous when you're in the 100s.